This next lady is someone whose movies I am not totally familiar with. Dagmar Godowsky is a name I have heard before in my readings of silent film books and articles and also in pictures I have seen, but I haven't watched her in movies (as far as I know). Something about the name Dagmar makes me think of the Blondie character, Dagwood. That and the 1950 pin up girl with the same name. 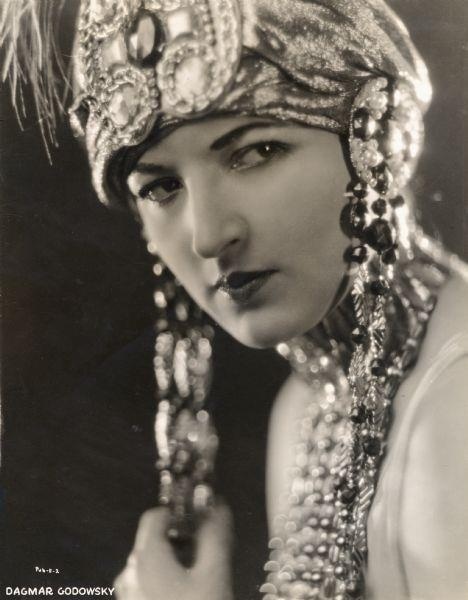 Dagmar Godowsky was born Mercedes Dagmar Godowsky November 24, 1897 in Chicago, Illinois. She was the second child born to famed composer, Leopold Godowsky and his wife Frederica. Her sister, Vanita, was six years older, and her brother, Leopold Jr. was a year younger. She made her screen debut in the film The Red Lantern along with Alla Nazimova and Noah Beery in 1919. Interesting side note, this film was also the film debut of Anna May Wong. That year and the years following, she shared the screen with Rudolph Valentino, Sessue Hayakawa, Lon Chaney, Corinne Griffith, Marie Prevost, and Antonio Moreno. Not bad! Dagmar wasn't a huge star during the silent days, but she was a popular character actress. 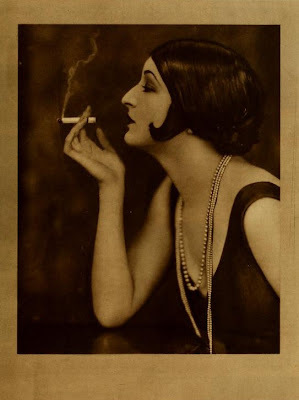 One of her most well known film appearances was in 1924's A Sainted Devil with Valentino. 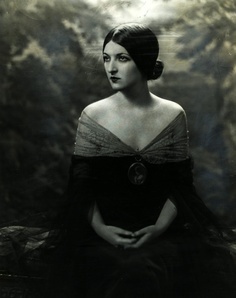 Her last film appearance was in 1926. She never appeared in a talking picture. 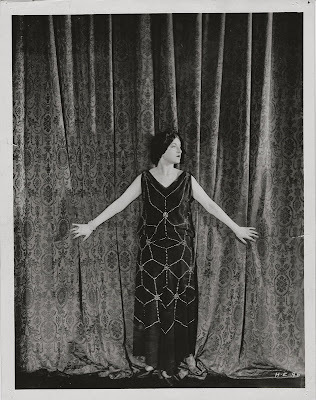 Dagmar Godowsky passed away on February 13, 1975 in New York City. She was buried at the Mount Hope Cemetery in Hastings-on-Hudson, New York. Dagmar was married twice, well, kind of. In 1921, she wed actor Frank Mayo in Tijuana. Unfortunately, Frankie boy was already married to another actress named Anna Luther. One day, Dagmar came home and found the two together and the truth was revealed. She sued Frank for divorce and the marriage was annulled in 1928. I really should do an entry about Anna Luther because she had quite a few dealings with the courts during her lifetime. Yowza! Her second marriage wasn't so great either. She married a man named James Sloane for about a day. After the ceremony he put his arm around her and asked her, "Who do you belong to now?" What a jackass! She filed for divorce right quick after that! She may have been unlucky in marriage, but according to her own words, she was not unlucky in love. In 1958, she published an autobiography where she named Rudolph Valentino, Enrico Caruso, Charlie Chaplin, and Igor Stravinsky (to name a few) as former lovers. Go big or go home, baby! Dagmar's young brother, Leopold had a bit of a fame streak in him as well. He worked as a scientist for Eastman Kodak and is credited with inventing Kodachrome film. Leopold was also married to Frances Gershwin, sister of Ira and George Gershwin. She was a cutie too! HELLO JESICA THIS IS EUGENE. I LIKED THE PROFILE ON DAGMAR.THE PHOTOS WERE LOVELY.I WANT TO SEE HER MOVIES TOO.